Taylor Swift’s music video for End Game featured the vocal talents of both Ed Sheeran and Future, but in this behind-the-scenes look at the making of the video, the featured talent is Swift and Sheeran’s friendship. Awwww. The two sit on a couch and talk about the song and the meaning behind the lyrics, and they honestly seem like brother and sister. Swift roasts Sheeran for always sitting on elevated chairs when he’s around her 5’10” frame, and they joke about Sheeran’s pseudo-rapping on the song, but the most important insight from this video is how Sheeran fell in love with his now-fiancée Cherry Seaborn at one of Swift’s iconic July 4th parties. The story goes that Sheeran and Seaborn went to school together but reconnected one July 4th at Swift’s Rhode Island house party. In the video, Sheeran explains the meaning behind his lyric, “After the storm, something was born on the fourth of July,” which he says is both the name of a Tom Cruise movie (lol, true) and a fact about his relationship. Sheeran: My relationship started on the fourth of July. Sheeran: Taylor’s house. So the story was, I was at Taylor’s party and a girl I went to school with [who] is pretty cool, ended up being in Rhode Island. Swift: She is the coolest. Sheeran: I was like, “Taylor can she turn up?” And you were like, “Yep,” and here we are. 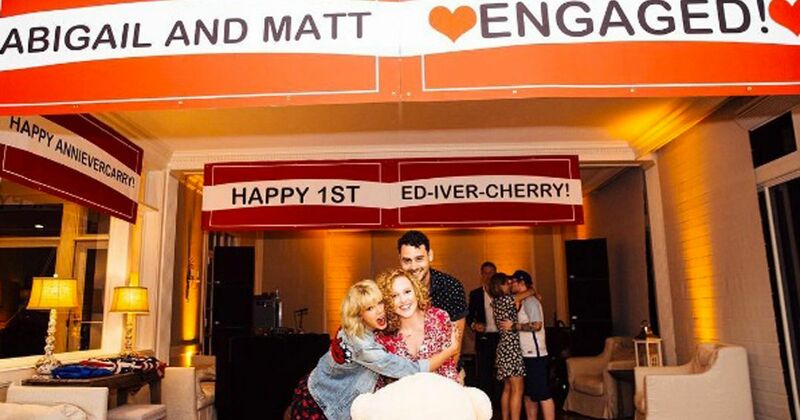 Swift and Sheeran later joked about the one-year anniversary party that Swift threw for him and Seaborn with a banner that said “Happy 1st Ed-Iver-Cherry,” a play on their names and the word “Anniversary.” That’s Sheeran and Cherry making out in the background. You can watch the entire “End Game” BTS video above and bask in Sheeran and Swift’s pure friendship.